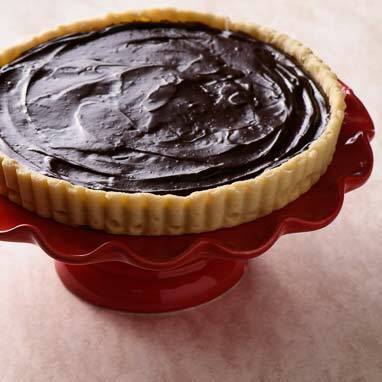 "I changed the name of this from its original: Grampa's Tart. My grandfather used to make this one for my mother, because she loved chocolate. After he had baked and cooled it, he would decorate it with many, many chocolate cigarettes, a crazy number of them. You can leave it plain, but it is fun to decorate with more chocolate, because this one was born to be "too much." The filling is more than a simple ganache, the classic truffle filling of cream and chocolate; egg yolks make this one even richer. You can accompany this with fresh raspberries and raspberry sauce, but it is just fine by itself."